OK. So, you see that pedal crank? Behind it hides the bottom bracket. 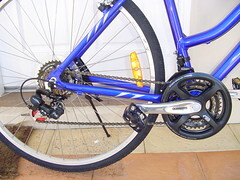 The bottom bracket attaches the two pedal cranks to each other, and runs through the centre of the frame. That bottom bracket is evil. It nearly brought my beloved bike mechanic to tears. He had to remove it because the pedals were creating a knock every time the pedals turned, which means that it needed either just a service or complete replacement. Kind of inevitable really, because it’d done almost 4000 km. Well he had to replace it as the bearings were shot, and you could wiggle the cranks up and down – which you really should not be able to do. So – removing it wasn’t too painful, but putting a new one in – a new, sealed bottom bracket rather than the unsealed one that I had on originally – was agony. It just wouldn’t screw in. Anyway, so after an absolute age, I have a new bottom bracket, and the mechanic has a bit of my hard earned and 2 six packs of very well deserved Heineken.